Exquisite Oil Strengthening Treatment is rated 4.6 out of 5 by 17. 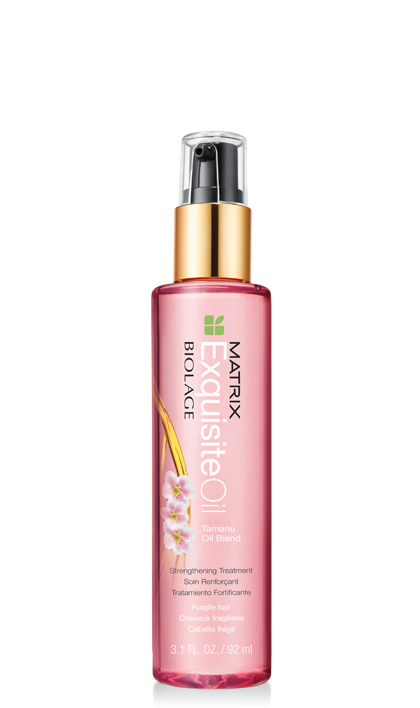 Share https://www.matrix.com/biolage/exquisite-oil/exquisite-oil-strengthening-treatment Exquisite Oil Strengthening Treatmenthttps://www.matrix.com/~/media/images/haircare/biolage/exquisite oil/biolage_exquisiteoil_strengtheningtreatment_b-eo-stt.jpg Replenishes hair with moisture and conditioning. Rated 5 out of 5 by Meganndeexo from BRING IT BACK This is the only thing thats ever helped my hair become strong and shiny and in turn it grow which it never does!! Absolutely gutted this cant be found anywhere PLEASE bring back!! it was the best one out of the exquisite oils! Rated 5 out of 5 by Tiffmck from The Best But Where to Buy NOW???? This isn't available anywhere, even online. Did it change? help! It's the best I've ever used!! Rated 5 out of 5 by jenlynnbro from Best hair oil...Please continue making this!!! I bought this on a whim one day and have fallen in love! It doesn't leave my fine hair greasy but gives it such a nice shine, and I do feel like it strengthens my hair. And a bonus is the compliments on how good I smell when I use it. I am close to the end of my bottle and can't find it anywhere now! Hopefully, they will keep making it. Rated 5 out of 5 by Superdeb from WHERE IS IT? Love this product, but I can not find it anywhere, even on-line??????? Rated 5 out of 5 by Krysten from Must have. Repeat...must have. I bought this after my last haircut and color in February. My stylist uses the product and recommended because we both have fine hair that's colored. Smells great. Feels great. You can really tell just by the look and feel of your hair when you have a great product! Tames frizz, softens and detangles. I love this product! Rated 5 out of 5 by Sher13 from Awesome Product Love how it makes my hair feel and look and it smells great too. Rated 5 out of 5 by Essie from Love the look and feel of my hair. I have been using this product and i notice my hair strength has inproved and like that its lightweight.